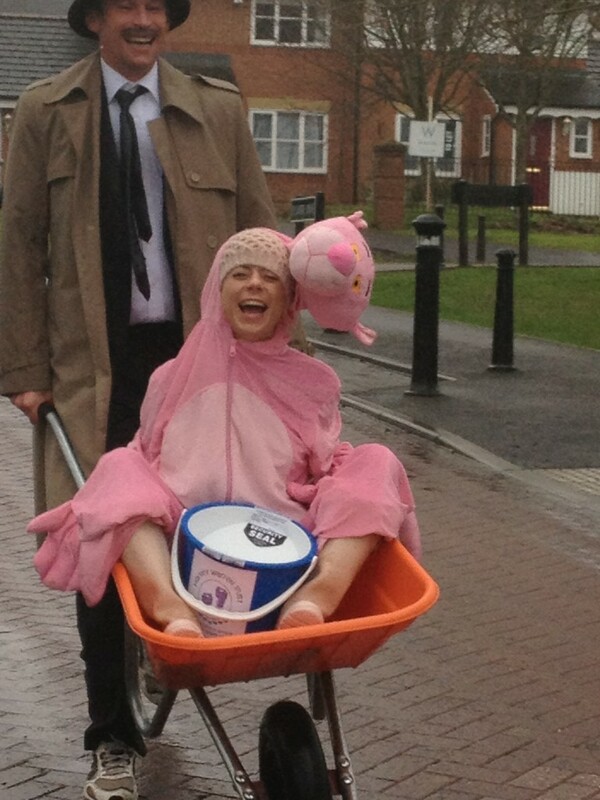 To mark January 1st this year, at 1200, a small band of hardy souls donned fancy dress and boarded their barrows for the inaugural New Years Day Wheelbarrow Race for Harvey Warren Trust. Due to the horrendously inclement weather, the number of attendees was sadly diminished but we all had a thoroughly good time and welcomed 2014 in style ! A hearty chilli lunch afterward was well earned as the runners dried off. 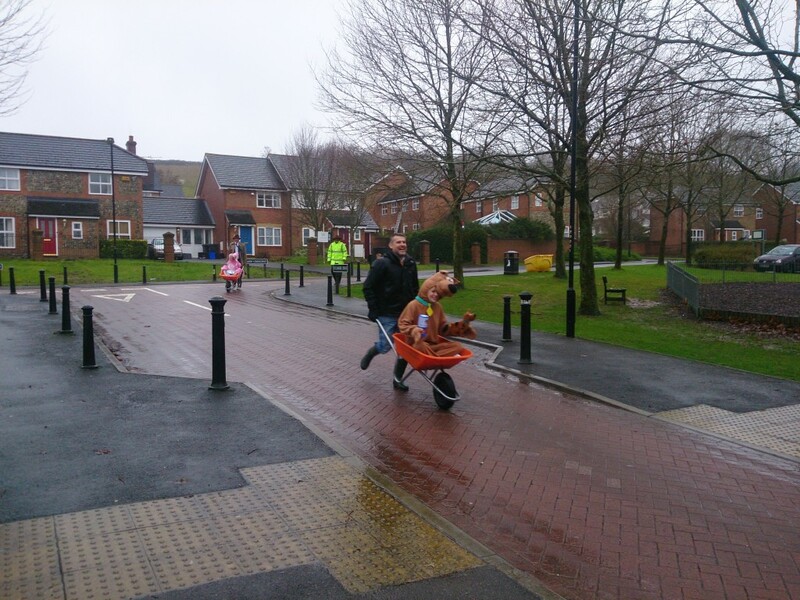 The race was started by Judy Warren and won by Scooby Doo and the prize for best Fancy dress was awarded to Inspector Clousseau, Cato and the Pink Panther. Thank you so much to all those who dragged themselves out in the conditions to run, cheer or marshall. We are very touched by the support our family and friends who came from as far as London, Ascot, Poole and Plymouth to participate as well as the local crowd. Thank you also to B&Q, Homebase and Dave Hare from Ford for kindly supplying wheelbarrows for us. We would also like to extend our thanks to the Council for permission, to The Salisbury Journal for the fabulous articles and the photographer who attended, to Spire FM and BBC Wiltshire for promoting the event. An on air interview with BBC Wiltshire can be heard here and please do look at the photo gallery ! Even in these conditions over £150 was collected in buckets with more online for which we are very grateful. 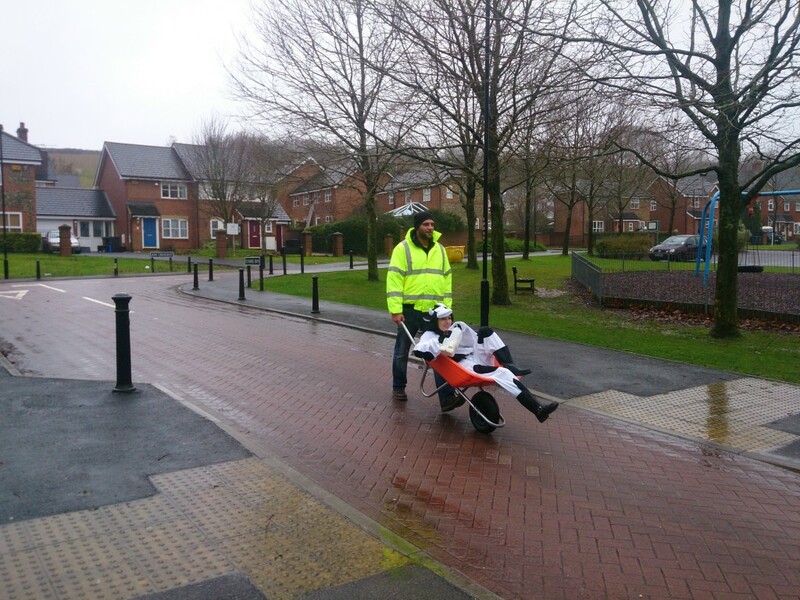 Let’s hope for better weather next year when we hope to hold the event again and look forward to more wheelbarrows and some interesting fancy dress. Edit: Please see link below for article from the Salisbury Journal.